Catch, push with the legs, arms away, breathe. Drop, push, arms, breathe. It’s a Monday morning in early June and we’re one of the only boats on the water. Snow is coming straight into our eyes as we try to row under several layers of clothing meant to keep out that –1 C temperature. My legs are numb, regardless. 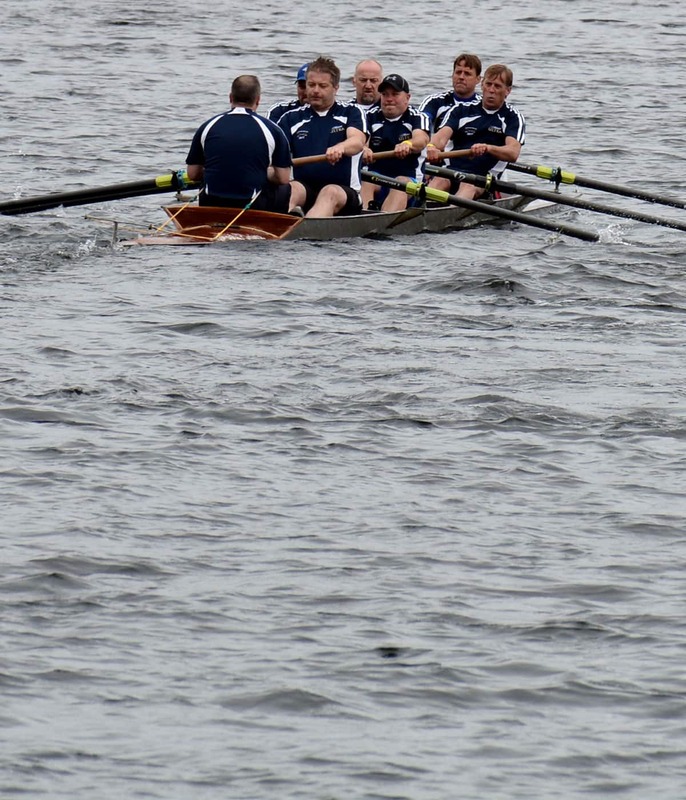 This is how the Royal St. John’s Regatta got to be the oldest continuous sporting event in North America, right here in St. John’s at the edge of the North Atlantic. Appropriately enough, the lake (affectionately called “the pond”) that hosts all this rowing is just a stone’s throw from that ocean, with its own frustratingly unpredictable weather and wind. The regatta is the only weather-dependent civic holiday, falling on the first Wednesday of August. Non-rowers have a game called Regatta Roulette: drinking the night before, in hopes of having the day off. “OK girls, there’s a squall of wind coming up!” our coxswain, Rick Coish, warns. He and our coach Mike Hickey are two of the best going, both as rowers and in leading teams to championships, and we mostly row for them. We row to hear Hickey say, “Girls, I couldn’t be prouder,” with a smile as wide as the lake. We brace ourselves against the wind, hoping we may eventually reach the dock and be “in out of it,” as we say in Newfoundland. Six women each rowing their own oar in unison to lift the boat along the water. In these boats, the seats are fixed. That means our behinds do the sliding — whereas the kind of rowing you’ll see pretty much everywhere else is slide seat. The seats move, so your bottom doesn’t have to. We actually spray car wax on our seats to help slide. If it all sounds a bit cracked, that’s because it is. When the sun is shining just so, there’s no better place to be than rowing on Quidi Vidi Lake. That’s one of the reasons why we love it. Tradition, challenge, teamwork, the chance to get outside and enjoy the limited yet unmatchable summer days in St. John’s … all reasons we row. But the biggest, for me, is that it’s so damn hard. Apart from being one of few places left in the world with fixed seat rowing boats, the Royal St. John’s Regatta course is gruelling. It’s an endurance sport, and you’re tired after the first few strokes. The men’s course is 2.45 kilometres and the women’s is 1.225. Due to the length of the lake, we have to turn around a buoy to finish at the starting line, which you don’t see anywhere else. There are five lanes, with a crew racing in each. On the way back, a band plays Up the Pond from the bandstand near the finish line, but you don’t hear it, because you’re focusing on rowing through the pain. The top-five fastest male and female crews on regatta day row twice — earning a place in the evening championship races. Just two years ago, we shocked ourselves and everyone else by making it to the women’s championship and finishing third. It could have been the champagne my dad handed me when we got out of the boat, but we were positively giddy on the podium getting our bronze medals. So we made championship the next year, and this year’s goal is no different. Competitive crews like ours (we’re called “Dawe and Burke” by the way — all cheering welcomed, local and long distance) train throughout the winter. We row twice a day, morning and evening, once the boats go on the water in May. Scheduling alone is a tiny miracle. Seven people have to align to make it happen. My work schedule changes week by week, and I can do a shift that starts as early as 4 a.m. or ends as late as 11:15 p.m. People often look at me in mild disgust saying, “I don’t know how you do it, McCabe.” But you do what you love, and with a team relying on you there’s no option to just not show up. Drone's eye view of regatta crew. Rowers are resilient. People have lost loved ones during the season and kept going. I suffered my own personal trauma last season and worried I couldn’t be the teammate I needed to be. But no matter how rough a night was, the morning always came with a commitment to row — and I kept it. Rowing saved me, and the therapy of pouring all your stress onto the end of an oar is something else. Add the team support around you, it’s unreal. “Row long and strong,” coach Hickey says. He hasn’t been well this summer, and couldn’t be there for the time trials in early July, which determines which race you’re in on Regatta Day. Fighting the other crews for that top-five spot, Coish yells, “Four hard strokes for Mike Hickey, do it for Mike, now.” With every fibre in our being, we channel our power into our oars and we can feel the boat lift all the way to cross the finish line first. That’s rowing. Despite the work, training, technique — it can come down to the luck of a race. The wind can pick up. You can lose an oar. You could just have a bad day. It’s a hard ol’ go, in a competition taken very seriously by some, or just a laugh by others, it doesn’t matter. Top crews aiming to break records train like Olympic athletes, not kidding. We don’t go that far, but our crew still works awfully hard to do our best because we want to, and for that fantastic, euphoric feeling at the end of the race when we know we gave every ounce. The women’s course record is four minutes 56.70 seconds, set in 2003, and the men’s is 8:51.29 set in 2007 — and the rowers who earned them still row, with others nipping at their oars to break them. Back in 1994, the record-setting women’s crew ‘OZFM’ had quite a rivalry with Keyin Tech, led by our coach and coxswain. In the championship race, they finished 4:59.52 and 4:59.84, respectively, with Keyin initially thinking they’d won. That’s how intense it can be. This thing began as ship’s crews and fishermen racing, back in the 1700s. It is remarkable that it is still going. The Regatta Committee uses 1818 as the official start of the organized event we know today — races on the water, roughly 50,000 people on the shore, carnival games and a bustling beer tent. Interest in this year’s 200th regatta was so great the committee had to cut off registration. Still, 156 crews are competing. A number of them are young, carrying on the family tradition. Regatta rowing in St. John’s is its own universe in a way people who don’t row, don’t understand. I think that’s just fine, because it keeps it sacred for those of us who do. There is nothing else I’d rather be.